Elio Motors is forging new territory here, as our innovative vehicle is unlike anything else on the road today. We applaud Rep. Moolenaar for recognizing this vehicle needs a new approach to safety and fuel economy legislation. 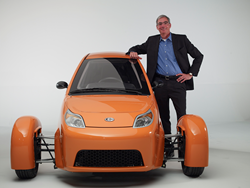 Elio Motors CEO Paul Elio knows innovation is the key to getting his company’s enclosed three-wheeled vehicle to market. That includes unique legislative changes which recognize the company is creating an entirely new vehicle category. Earlier this week, U.S. Representative John Moolenaar (R-MI) introduced HR 2892, The Autocycle Safety Act, which creates the new classification “autocycle” for enclosed motor vehicles with three wheels. Similar legislation, S685, was introduced in the Senate in March by Senator David Vitter (R-LA). Currently 26 states have enacted or are currently developing classifications for enclosed, three-wheeled vehicles as autocycles at the state level. But, setting rules at the Federal level will ensure consistency when customers drive their Elio from state to state. “From time to time, regulations have to be updated to keep pace with American ingenuity and innovation. Elio Motors is leading the way, but outdated regulations are blocking the road forward for the emerging autocycle industry,” Moolenaar said. Elio Motors is developing an enclosed, three-wheel vehicle that is expected to sell for $6,800 and will get up to 84 MPG. The company recently announced it will build its fifth generation prototype, the P5, which will include a new engine built from the ground up by IAV and a transmission from Aisin. Elio Motors, which values innovation in every area of its operations, also recently announced a crowd-funding campaign based on JumpStart Our Business Startup (JOBS) Act Regulation A+ which took effect on June 19. The regulation allows start-up companies to “test the waters” and see if non-accredited investors are interested in buying into the company. Elio Motors’ Regulation A+ information can be found at crowdfunding investment platform StartEngine.com. The prototype, the investment strategy and the legislative initiative are all visionary strategies important to help move Elio Motors closer to production. The Elio will be manufactured in Shreveport, La., at a former General Motors facility that made vehicles such as the Hummer H3 and Chevy Colorado. The low-cost, high mileage vehicle has already been a hit with consumers. Elio Motors has taken more than 43,000 reservations for a spot in line. It is expected to go into production in 2016. Founded by car enthusiast Paul Elio in 2008, Elio Motors Inc. represents a revolutionary approach to manufacturing an ultra-high-mileage vehicle. The three-wheeled Elio is engineered to attain a highway mileage rating of up to 84 mpg while providing the comfort of amenities such as power windows, power door lock and air conditioning, accompanied by the safety of multiple air bags and an aerodynamic, enclosed vehicle body. Elio’s first manufacturing site will be in Shreveport, La. For more information, visit http://www.eliomotors.com or http://www.facebook.com/ElioMotors.